There have been lot of articles about legitimate chrome/ opera extensions that get sold out to malicious parties that end up pushing the wrong kind of code down the pipe, since by default these extensions auto update. How could we trace which ones is causing certain behaviors? e.g. I got these 2 site/ URLs on my Opera (Chromium base) browser and upon googling them cant understand why and where from they showed up while I was doing some changes and rebooting my "Tomato Router". I'd like to trace where if any redirectors are sitting. Some specifics sanitized out. My scans with Avira and other Anti Virus did not bring up anything conclusive. I'd like to do & learn to do a bit of manual research into extensions. If you see any activity on the browser that has these show up/ key words that might point to these issue then the following solution may help. The Extension "Tab Manager" was sold to a malicious 3rd party and users were not notified in any fashion by the original dev. On the github source code page he pointed to a new entry for the Extension, which most users dont have any way of being notified or knowing. For this, users need to delete and remove the old extension and if they want they can install from the new link. This is a Google Chrome extension which allows you to easily and quickly manage and access your tabs/windows ;) Have fun with it! IMPORTANT: The old "Tab Manager"-entry in the chrome web store has been sold and I am no longer the owner! Neither do I know the source code of the version that currently gets deployed there. Please note that only the web store entry and no source code has been sold. I, and all contributors of the project, are still the owners of the source code. I've also created a new entry on the chrome web store. I'll keep it up to date with the source code as with the old entry. But, I still wonder what could we people / users do in future to keep track of such "handovers/ sellouts" and take steps. Consequently after being criticized for introducing such activities into an open source project, the original author/ dev just made a bait/ switch on the open source project and high tailed out after his open source project turned sold into Malware, with prospective infections of 1,43,000 (based on downloads/ installs of original extension from Chrome Store). 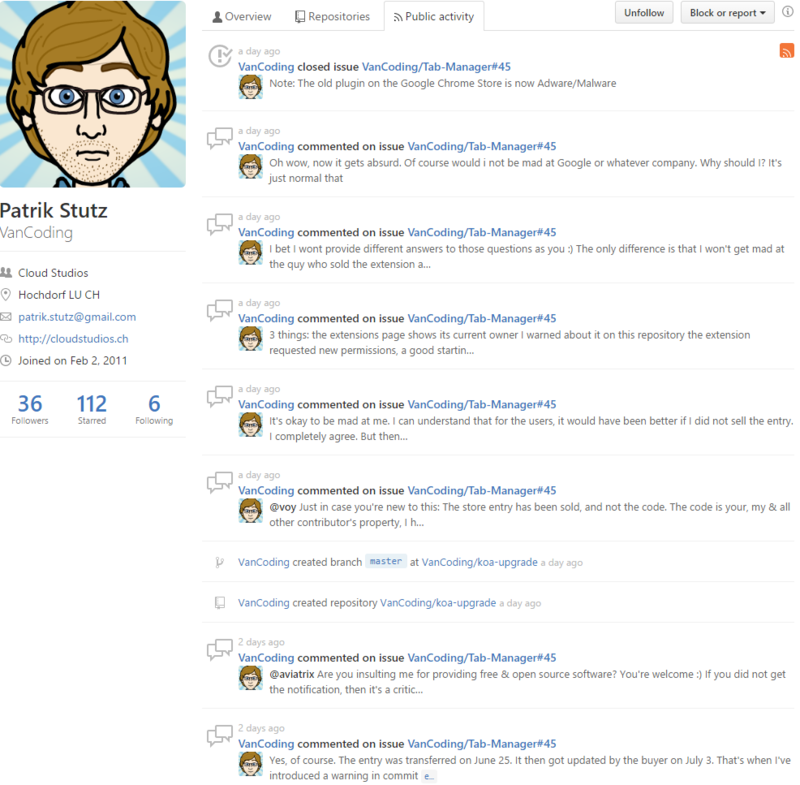 Finally, after arguing his stance he just removed/ deleted the open source project repository from GitHub. Not the answer you're looking for? Browse other questions tagged malware browser-extensions investigation or ask your own question. Do Chrome/browser extensions break the tab sandbox? How exactly does this Flash malware function on Ubuntu?